I try to find an excuse to head over to New York once a year. This year I decided that it was time we reviewed the well-regarded American Airlines Boeing 77W business class seat. This is the product that finally confirmed that the US carriers are no longer a laughing stock when it comes to long-haul business class seating – the AA seat appears far superior to Club World. We will see, however …. Needing a New York hotel for May, I took a look at my usual ‘luxury with points’ suspects. I wanted to see how the recent increase in the cost of top InterContinental hotels shaped my thinking. Using Hilton Honors points, the best luxury option is Conrad New York in Battery Park where I have now stayed three times. I reviewed it here. This is an ‘all suite’ hotel so you are getting a lot of space for your points. Add in the fact that the hotel is only a few years old and so in excellent condition and you have a great place to spend a couple of days. Conrad New York is 80,000 Hilton Honors points per night when I am there in May. The cash price is $705 (£504) per night including taxes, so I’d be getting 0.63p per Hilton point. This is double my usual 0.33p valuation. Not bad. I would receive free breakfast (from a restricted la carte menu, the hotel has no buffet) as I am a Hilton Diamond, or indeed if I was Gold. There is no guarantee of late check-out before my 10pm flight home. Using IHG Rewards Club points, the best two luxury options I have tried are the two InterContinental hotels, either Times Square or Barclay. 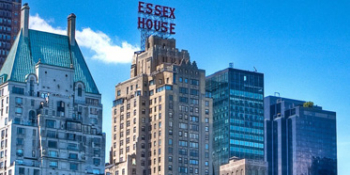 I reviewed Times Square here and I have stayed here three times – the plus point is the good views from the higher floors, the downside is the total lack of public space in the hotel. I reviewed the newly renovated Barclay here where I have only stayed once since it reopened (and once when it was scruffy!) – the plus side is the large amount of public space (lobby pictured above) and new rooms, the downside is that they are not very big. Following the recent increases, both hotels are 70,000 IHG Rewards Club points per night. Times Square is $575 (£411) per night and Barclay is $500 (£357) so I’d be getting 0.59p or 0.51p per point. These are both above my typical 0.4p valuation for an IHG point. As I am an InterContinental Ambassador (see here for more on this) I would get a guaranteed 4pm check-out. I did not look at Hyatt options because I do not have enough World of Hyatt points. I did not look at Starwood options because Starwood luxury redemptions are almost always bad value at 35,000 points per night – I could convert those into 40,000 airline miles instead. That left Marriott Rewards. Historically I have never been ‘a Marriott person’. The footprint is relatively light in Europe compared to the US and it has never been easy to pick up their points without doing the stays. Marriott Rewards was not an American Express Membership Rewards hotel partner and you could not get status via American Express Platinum. The UK credit card only earned a weak 1 point per £1. Frankly there was no reason to bother with Marriott when IHG and Hilton offered easy routes to status, generous bonus promotions, better hotels and Amex transfer options. I thought I would take a look at what was available in New York. Because Marriott redemptions cap at 45,000 points (The Ritz-Carlton brand has a separate higher pricing chart) they seemed excellent value in an expensive city. I normally value a Marriott Rewards point at 0.5p. In pricey cities such as New York you can do far, far better. For the dates I am there, the JW Marriott Essex House is an astonishing $958 (£685) per night. This means that I am getting a huge 1.52p per Marriott Rewards point based on 45,000 points per night. I have booked myself in, and will do a full review in mid May when I get back. …. which makes Marriott Rewards the clear winner in terms of maximising the value of the points I have. The recent 15%+ points rise in the cost of the two InterContinental properties has made them uncompetitive compared to Marriott Rewards in this example. The Conrad remains a decent alternative – especially as it is ‘all suite’. Remember too that as a Marriott Gold Essex House will give me lounge access and a 4pm check-out. The InterContinental Barclay would give me a guaranteed 4pm check-out as an Ambassador but no breakfast. Conrad New York would give me breakfast as a Hilton Diamond but not a guaranteed 4pm check-out. If you collect Marriott Rewards or SPG points, remember that the Starwood Preferred Guest American Express credit card has a sign-up bonus of 10,000 SPG points which converts in 30,000 Marriott Rewards points. My full review of that credit card is here and we also discuss it in our other article today. OT: I am fairly new to this, so after some advice. Had an Amex Gold Rewards last year and cancelled six months ago (having recommended my wife before doing so). Is it possible for my wife to now refer me in return? And so on and so forth going forward? Out of interest, what are the current points for recommending somebody for a gold rewards card. yep she can now recommend you and bag 9K MR points by doing so. However, I would consider getting your wife to upgrade to plat first (by using the link thats been around a while. This way when she refers you, she’ll get 18k MR points. Also if she can hit the 1k spend bonus she’ll get a bonus 20k MR points. Platinum has a £450 fee though! yes it has a pro-rata fee of £450, but you can be in and out pretty quickly hitting a 1k spend and a referral before the fee hits and even if it takes a month you will have paid £37.50 in fees but for this you should have upgraded your status for hilton, SPG/marriott and raddison plus bagged 38k MR points. It is what works for you but I’d be happy at those numbers. Thanks for the reminder of the 5th night free rule at Marriott, I had a 3 night stay booked with a night somewhere else (traditional Japanese hotel) and then back for a night, using the 5th night free means we can keep our bags etc in the room and not worry about checking out and its costing me the same number of points. Plus as you don’t need the points to complete a Marriott booking I could book my 5 nights before cancelling the other bookings ensuring there was reward availability! Thanks Rob. Just had an IHG Flash 100% bonus buy points offer if more than 5k. Valid till 22/3 only. Does anyone know please what benefits my nephew can expect as Marriott Gold at an AC hotel in Italy? The T&C are a bit vague, but suggest no breakfast. Definitely no breakfast. That is not an AC chain benefit. Not much beyond that either. Maybe a “better” room? They seem quite down the order in quality so it seems they don’t offer much/have much to offer. Nothing, same as ac in Barcelona last week. Very disappointing experience. Staff not inclined to welcome nor recognise status. Accor points have a fixed cash value so there is no ‘outsized’ value using them in NY, which makes it a very bad place to use them. Having just returned from a week in NYC, what amazed me was the cost of EVERYTHING. This starts with the hotels and applies equally to food and entertainments. We, stupidly, also paid an arm and a leg to get from the Lower East side to the Lower West side – we’d have been better off walking in the Friday afternoon traffic around lower Manhattan. If you are there for any period of time, get yourself an MTA time-period card, in our case 7 days. This saves a fortune and offers great value for money. But, reading the postings above, what amazes me most of all is that most posters are ignoring THE best service across the Atlantic by a country mile: BA001 from LCY via SNN to JFK (and return). The A318 has a capacity of 36 seats. The calm of US Customs and Immigration clearance at Shannon rather than the godawful queues at JFK is a godsend. The service onboard the service is as personal as you could possibly wish for short of First Class and gave me a hint of how things wold have been back in the days of Imperial Airways and the flying boats. We ate at the Conrad for free (I have Hilton status). If that’s a limited menu, I wish all hotels would offer the same menu. Multiple gourmet offerings, and they didn’t cheap out.